Established guidelines generally do not recommend using coronary CT angiography (coronary CTA) to screen for coronary artery disease (CAD) in asymptomatic individuals. Nevertheless, many institutions perform coronary CTA examinations in asymptomatic individuals as part of clinical trials or screening programs. Over the past few years, an increasing body of evidence on the potential role of coronary CTA in asymptomatic individuals has emerged from these institutions. This book chapter reviews the recent literature on coronary CTA screening for CAD in asymptomatic individuals. 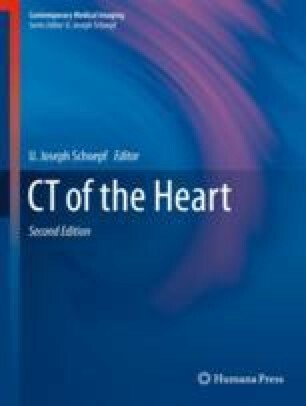 The chapter is organized along several leading questions: (a) How frequently is coronary CTA performed in asymptomatic individuals? (b) What is the diagnostic yield of coronary CTA in asymptomatic individuals? Can we identify specific high-risk groups with high diagnostic yield? (c) What is the prognostic value of coronary CTA screening in asymptomatic patients? Does it improve risk stratification beyond traditional risk factors? (d) What would be the consequences for management, if CAD was detected in asymptomatic individuals? (e) Do we have evidence that coronary CTA screening for CAD improves patients’ outcome? Wilson JMG, Jungner G. Principles and practice of screening for disease. Public Health Paper Number 34. 1968 [cited 18 Oct 2016]; Available from: http://www.who.int/iris/handle/10665/37650.